We stock carbon steel reeds in four lengths. And we stock stainless steel reeds in longer sizes, with some overlap. These come 5" tall (outside dimensions), except the 19-inch-long Wolf Pup reeds are only 4½" tall. Lengths listed below are outside. Their teeth are locked into top and bottom metal channels with permanent epoxy. The metal channels are covered with non-marring extruded plastic. These are industrial-grade, lifetime reeds. We can special-order reeds in many other lengths, heights and dents. Call for a quote. 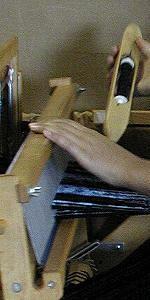 We can supply reeds from any of our loom-makers: Cranbrook, Leclerc, Louet, Schacht, Toika. Please ask for pricing for available sizes. Standard shipping charges apply to all special order reeds (even if they travel as back orders), and they will take longer to get. "SS" is stainless steel, in the list below.